Few of Edgar Rice Burroughs’s books offer as much promise to modern filmmakers as At the Earth’s Core. The inner world of Pellucidar is vast and strange, and the potential to craft astonishing vistas from this concave land with a sun that never moves is immense. Plus, the tyrannical Mahars are ideally suited for realization as complex creatures using mo-cap. 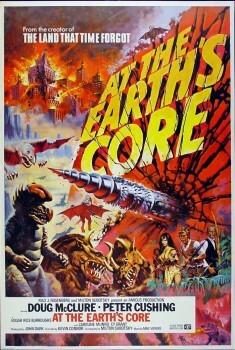 However, nobody appears to be working on an At the Earth’s Core movie at the moment. For shame. We have to settle for a movie made in the last glory days of low-budget SF spectacle, before the advent of Star Wars. That shining era when rubber monsters, matte paintings, and Doug McClure ruled fantasy cinema. The 1976 At the Earth’s Core isn’t a bad way to settle. For those who grew up with it, the movie still holds a special charm because of its colorful spectacle and practical effects. It had to sacrifice some of the fascinating parts of the setting of Pellucidar because of budget limitations, but it’s an accurate rendition of Burroughs’s plot. 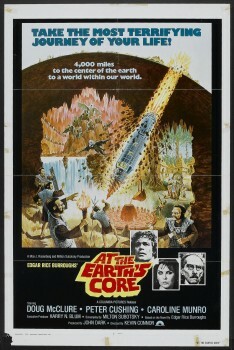 At the Earth’s Core is second of a trio of mid-‘70s ERB adaptations from the team of producer John Dark and director Kevin Connor for Amicus Productions and American-International Pictures. The first and third films are a split adaptation of the novel The Land That Time Forgot, The Land That Time Forgot (1975) and The People That Time Forgot (1977). Dark and Connor produced two more fantasy films afterward, the ERB-esque Warlords of Atlantis (1978), made after they realized it was too expensive to mount a John Carter movie; and the mostly forgotten Arabian Adventure (1979). Although I’m about to say many admiring things about At the Earth’s Core, it’s my least favorite of the Amicus-AIP Burroughs movies. The director shares my opinion: Kevin Connor has called the movie “clunky” compared to the other two, and it’s easy to see what he means in the studio-bound confines and the more awkward pacing and plotting. But it’s by no means a bad film, and when I place it a notch below The Land That Time Forgot and The People That Time Forgot, that isn’t a harsh slam. The special appeal of this vanished era of imaginative filmmaking is hard to resist. One leading edge that At the Earth’s Core has is that it’s one of the more faithful film adaptations of an Edgar Rice Burroughs novel. Most of the plot ends up on screen. The action opens with the same sprinter’s speed as the novel, with American financier David Innes (Doug McClure) and British inventor Abner Perry (Peter Cushing) boarding the enormous Iron Mole drilling machine for what they tout as a short drive through the Welsh hills. For visual flourish, the launching is a public affair with spectators and a brass band; the book has Innes and Perry depart in secret. But the disaster that follows is identical, right down to the Iron Mole’s passage through intense heat and an ice layer before the drill breaks through to the inner world of Pellucidar. The story continues along the same beats as the book, at least until a finale that requires a more decisive wrap-up. The Sagoths, who are given a porcine makeup that will remind a few D&D players of early orc artwork, capture the two visitors to Pellucidar. Innes meets and falls for beautiful captive Dia (Caroline Munro), whose name has lost the “n” from Dian for some reason. After various escapes and chases and run-ins with weird beasts, Perry and Innes discover a way to defeat the reptilian Mahars with the help of the human prisoners and the discovery of the secret of Mahar reproduction. Hooja the Sly One (Sean Lynch) and Jubal the Ugly (Michael Crane) make trouble for Innes’s romance with Dia. The plot may be familiar, with a few tweaks (such as Innes saving Ja from a carnivorous plant rather than a Labyrinthodon, and that Ja’s name has been changed to Ra), but the world of Pellucidar in the movie is less familiar. It’s been reduced from a vast land where time is meaningless to a standard subterranean setting that can fit a soundstage. Perry describes this Pellucidar as an underground cavern, and the perpetual purple sky comes from the magma above. There’s a brief mention of the difficulty of keeping track of the passage of time, but this has no effect on the story and is soon discarded. The limits of interior shooting erase the uncanny concavity of Pellucidar, and more screen time is dedicated to the cramped underground Mahar city. This Pellucidar doesn’t feel like part of a greater world, and it loses some of the source material’s best concepts. At the Earth’s Core takes a lighter approach compared to the other films. The Land That Time Forgot in particular maintains a consistent serious tone, closing on a grim and memorable finale. Its outdoor location photography adds a sense of realism to the fantasy story and monster effects. But At the Earth’s Core occurs entirely on soundstages filled with garish artificial plants and rocks, creating the atmosphere of a Disneyland dark ride. There’s a comic wink to most of it, the sense that the consequences aren’t too serious and whimsy is hiding behind all of it. On its own, this doesn’t make the movie one to dismiss, but it does lessen the effect. There’s simply less urgency and excitement. Doug McClure’s performance is one part of At the Earth’s Core that’s an improvement over the other ERB movies in the series. McClure is more suited as an actor to lighter fare, and the role of David Innes is a better match to his talents than that of Bowen Tyler from the two Time Forgot films. McClure shines brightest when he works across from Peter Cushing; Innes’s brash Americanisms (like puffing on a cigar while starting up the Iron Mole) are a good contrast to Perry’s fussy Victorianism. McClure also has good chemistry with Caroline Munro’s Dia, and the romance plot works better than it does in the novel. It helps that Munro looks like she broke free from a Frank Frazetta painting. Few actresses are so visually suited for Burroughs — she could’ve hammered down the part of Dejah Thoris if A Princess of Mars were filmed at the time. Munro was a vibrant presence in many 1970s genre films (Dracula A.D. 1972, The Golden Voyage of Sinbad, The Spy Who Loved Me), and her simply showing up elevates any genre film. Yes, even Starcrash. This brings us to Peter Cushing as Abner Perry. I used to feel down on Cushing’s performance, and that derived from my intense — uhm, obsessive? — admiration for the actor’s body of work. It’s no exaggeration to say Cushing is my favorite actor. He was the grand man of Hammer Films and one of the finest British film and television actors of his generation. But his performance in At the Earth’s Core as a bumbling Oxford don-type with a high-pitched voice was off-putting to me. What I adored the most about Cushing was his steely charisma as powerful and occasionally twisted authority figures such as Van Helsing, Sherlock Holmes, Victor Frankenstein, and Grand Moff Tarkin. Abner Perry felt like an aberration. 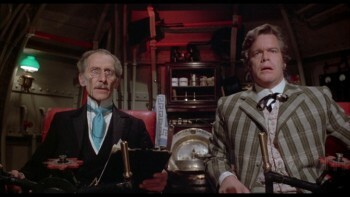 But my opinion on Cushing in the movie has changed — and for the simple reason that Peter Cushing deserved to have fun. The actor’s personal life was in a horrible place in the mid-‘70s. His wife Helene died suddenly in 1971, which plunged Cushing into a depression abyss that damaged him emotionally and physically. When he resumed acting, his gaunt appearance made him look a decade older than he was. He was sixty-three when he filmed At the Earth’s Core, but passes easily for an eighty-year-old absent-minded professor. Although this transformation is tragic, Cushing’s performance is anything but: once I eased into the mindset that “Pete’s allowed a good laugh considering what he’s gone through,” I began enjoying what he brings to At the Earth’s Core. He has a handful of fine comedic moments, such as when he abruptly takes a seat during an intense chase at the finale and says, prompted by nothing: “David, what would you think of going to the moon?” He also gets to deliver the line of the film, shouting to a Mahar: “You can’t mesmerize me! I’m British!” (Seconds later … mesmerized.) Ah, dear Peter, the world shall never see such a one as you again. (The digital Cushing in Rogue One doesn’t count.) Long may you blow up planets, inflict medical horrors, and stake blood-suckers in our cinematic dreams. You can wallop some Sagoths with a parasol too, I’m fine with that. 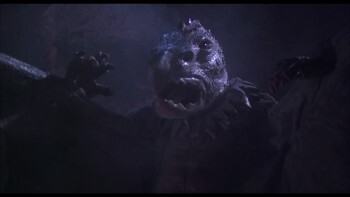 The Mahars posed a filmmaking challenge, since not only the budget but the available effects technology prohibited making the super-reptiles as impressive as they are in the novel. Stunt performers in bulky suits had to suffice, and the large head designs make the Mahars resemble scabrous parrots rather than advanced Rhamphorhynchuses. Watching the Mahars dive onto their victims, swinging floppily from wires, makes you understand why Kevin Connor thought “clunky” an appropriate description of the movie. However, the filmmakers worked around these problems to give the Mahars actual menace with editing and close-ups of their glowing eyes, accompanied with electronic shriek effects to demonstrate their telepathic powers. The monster effects depart from those in The Land That Time Forgot, which used puppetry for its creatures. At the Earth’s Core goes with more suitmation, and the beasts are a weirder assortment that can’t be easily identified with prehistoric creatures. That’s suitable for Pellucidar as well as the lighter tone — a fight between what look like bipedal Megatheriums is pleasantly goofy — but it’s still a notch down in quality. The model effects for the Iron Mole, however, are first-rate and hold up well today. The most entertaining VFX set piece pits David Innes against a four-footed reptile in an arena battle that has no equivalent in the novel, but is such a standard ERB trope that nobody will complain. The melding of rear-screen projection of the suitmation creature and a life-sized head prop makes McClure’s interaction with it feel real. There’s also a fun fire-breathing toad sequence, which concludes on a comical touch, but it’s forgivable if it means Peter Cushing gets to kill a monster with arrows and a one-liner. At the Earth’s Core is currently available in Region A Blu-ray from Kino Lorber, with a surprising amount of bonus features for a film of this vintage: lengthy interviews with Kevin Connor and Caroline Munro and a feature-length audio commentary from Connor. Kino Lorber has also released The Land That Time Forgot and The People That Time Forgot on Blu-ray, all worth your cash if you have a love for this vanished SF movie era. Still, I despair that I’ll ever see a North American release of Warlords of Atlantis. Ryan Harvey is one of the original bloggers for Black Gate, starting in 2008. He received the Writers of the Future Award for his short story “An Acolyte of Black Spires,” and his stories “The Sorrowless Thief” and “Stand at Dubun-Geb” are available in Black Gate online fiction. A further Ahn-Tarqa adventure, “Farewell to Tyrn”, is currently available as an e-book. Ryan lives in Costa Mesa, California where he works as a professional writer for a marketing company. Occasionally, people ask him to talk about Godzilla on interviews. I enjoy all of these movies, and I do have a special respect for this one simply because it has such a fearlessness about how it tries to adapt so many fantasy concepts despite a pretty low budget. I suspect most filmmakers would have watered the whole thing down, especially today when it’s all about “realism” and drab, monochromatic visuals. Unfortunately with the massive bombing of John Carter and the tepid response to Legend of Tarzan, I think ERB’s days as an author to get special attention from Hollywood are probably numbered. I remember they also visited Pellucidar in that live-action Tarzan series from the 1990s (back when everybody wanted to make the next Hercules/Xena), although I think they got there via a portal rather than the polar opening or anything. One of the mainstays of my childhood – I was a McClure fan at ten. I rewatch these movies regularly, and the amount of fun that can be extracted from them compensates technical and budget problems. Saturday afternoons at the multiplex didn’t get any better than this. This has always been my favorite Cushing performance. Absolutely loved him in this. As you said, that “mesmerize” line is the line of the movie. Hey Ryan, I’m one of the few people I know who’ve seen Warlords of Atlantis (at a drive in during its original release– I recall it had a good score) but I don’t believe I’ve ever even heard of Arabian Adventure. Very pleased to have you back, by the way. Chris, I’ve never seen Arabian Adventure, and the first I heard of its existence was an interview with Kevin Connor where he talked about it as the last movie he did with John Dark. There were some clips included that don’t make it look that impressive, but I definitely want to dig it up at some point. Unfortunately, it isn’t available in any home viewing format that I can locate, much like Warlords of Atlantis. Looking up Arabian Adventure I’m a little astounded that it starred both Cushing and Christopher Lee, and also Mickey Rooney (?!). It was rated G, so it’s likely to be entirely focused on a children’s audience circa 1979…so chances are it wouldn’t offer much to please me today. Still, with that cast I can’t help but be curious. And threw War Gods of the Deep and Message from Space into the Amazon cart, just on general principles. if Arabian Adventure is the film I think it is, then be warned that it is dull. This seems to match most opinions I’ve heard on it. Still, I’ll need to give it a watch just to be a Connor-Dark completist (something I didn’t realize you could be until now). I haven’t seen this since my dad took one for the team and chaffeured me to it. Fond memories because of that, if nothing else. I need to get the dvd.